Which Tablet Computer Should I Buy? There are so many Tablets out in the market now that the questions plaguing many consumers are which tablet should I buy? and what is the best tablet? So we are going to make it easy for you, we will compare tech specs, prices, apps, and contracts for up to 7 tablets and narrow it down to 3 of the best and most worthy of being purchased. 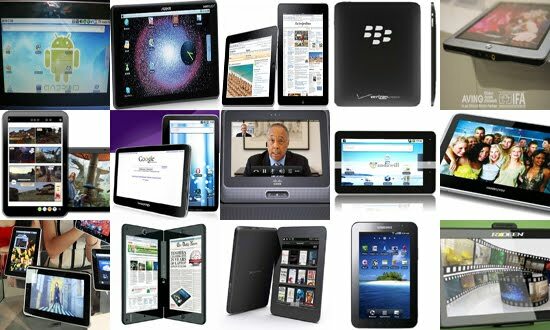 We compare the Blackberry Playbook, Motorola Xoom, LG G Slate, Acer Iconia, Asus Transformer, Nook Color, and of the course the Apple iPad 2. First up is the Blackberry Playbook by Rim which is a well built machine, the marriage of rim software and hardware lives up to the companies reputation but the lack of apps and lack of native email support and frankly the smaller screen size make it something we don't want to pay $500 for and we don't think you should either. Next up is the LG G-Slate from T-Mobile, that's right signing a 2 year contract with T-Mobile is the only way to get one of these tablets right now and we don't think it's a compelling enough reason even though the tablet has good 3D effects. It's good but not good enough. The hardware specs on the 10 inch Acer Iconia A500 holdup and it costs $50 less than an iPad 2 but why pay $450 when you can pay $400 for its cheap competitor, the Asus Transformer. The Asus Eee Pad Transformer costs just $400 and you can add a keyboard dock for $150 which turns the Tablet into a netbook. The Motorola Xoom is a wild card, as much as I love the fact that it runs on the Verizon network and will soon have LTE 4G compatibility for ultra fast connections on the go, at $600 with a contract it's a little too expensive at least for now. The Barnes & Nobles Nook Color has recently gotten an upgrade to Android 2.2, that's right the nook is a full fledged android tablet now with apps. Best of all it's still $250 which is $150 cheaper than the nearest Android tablet and half the price of an iPad 2. Is it worth considering? oh you bet it is! And last but not lease the Apple iPad 2 which is the king of all tablets with it's super slim design, great price, and over 10,000 apps out there to enhance your tablet experience, it's still the number one player in town. So in summary 3 tablets are worthy of your purchase, the Apple iPad, Asus Transformer, and the Nook Color.